Alarrm 4: Three Admit Inciting Terror Acts! Waseem Mughal, "Imagine how many (people) have gone (to Iraq) after seeing the videos. Imagine how many have become shahid (martyrs) "
Three al-Qaeda-linked men have admitted inciting terrorist attacks against non-Muslims on websites and in e-mails. Younes Tsouli, 23, of west London, and Waseem Mughal, 24, of Chatham, Kent, changed their pleas on Monday. A third man, Tariq Al-Daour, 21, of west London, has now changed his plea at Woolwich Crown Court to guilty. The three men are the first people to be convicted of inciting terrorist murder via the internet. They will be sentenced on Thursday. The court was told Al-Daour, Tsouli and Mughal had close links with al-Qaeda in Iraq and believed there was a "global conspiracy" to wipe out Islam. For at least a year they used e-mail and radical websites to try to encourage people to follow the ideology of Osama Bin Laden. The jury heard footage was found in their belongings of Briton Ken Bigley pleading for his life and Americans Nick Berg and Daniel Pearl being killed. Following a two-month trial, all three admitted inciting another person to commit an act of terrorism wholly or partly outside the UK which would, if committed in England and Wales, constitute murder. They also admitted conspiring together and with others to defraud banks, credit card companies and charge card companies. Computers, notebooks and digital storage media were seized when police raided the homes of the three men. Moroccan-born Tsouli, of Shepherd's Bush, used the online tag irhabi007, which came from the Arabic word for terrorist and the code number of James Bond. The court heard how Tsouli had told British-born Mughal in an online conversation that he had been asked by al-Qaeda to translate the organisation's official e-book into English. The book - Thurwat Al Sanam, or Tip Of The Camel's Hump - is said to promote jihad, or holy struggle. Investigators found a computer presentation called The Illustrated Booby Trapping Course on Tsouli's laptop computer. A film about how to make a suicide vest was found on a CD at Mughal's home. Deputy Assistant Commissioner Peter Clarke, head of the Met's Counter Terrorism Command, said: "This is the first successful prosecution for inciting murder using the internet, showing yet again that terrorist networks are spanning the globe." 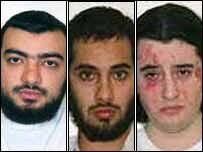 "Tsouli, Mughal and al-Daour used stolen identities, false credit card details and hidden chat room forums. Their terrorist tradecraft was sophisticated, but nevertheless defeated by this investigation." The judge, Mr Justice Openshaw, directed the jury of eight women and four men to return formal guilty verdicts against Al-Daour, in light of his pleas.